The two most senior officers of the Nigeria Police attached to President Muhammadu Buhari have been elevated to their next ranks. 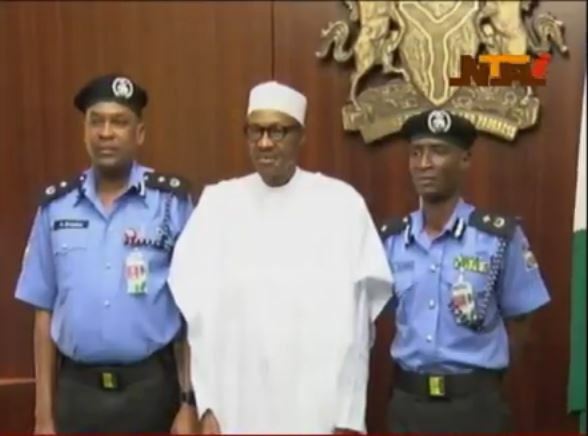 State House Correspondent Adamu Sambo reports that the Officers were formally decorated with their new ranks at a brief ceremony witnessed by President Muhammadu Buhari. One of them include the Chief Personal Security Officer to the President ACP Abdulkarim Dauda who is now a Deputy Commissioner of Police. Born in 1963 DCP Dauda a graduate of Public Administration, joined the NIGERIA Police in 1985. Also benefitted from the promotion exercise is the Officer in charge of the Presidential VIP movements ACP Kayode Akande elevated to the rank of Deputy Commissioner of Police. DCP Akande was enlisted in to the Nigeria Police in 1990. President Muhammadu Buhari congratulated the officers for their promotion which he described as a reward for hard work and excellence in service delivery. He urged them to work harder in order to justify the confidence reposed in them by the Police Force and the nation. The newly Promoted Officers were full of gratitude for their elevation and reaffirmed their loyalty to the PRESIDENT and the Federal Republic.